Traditional lever locks are no match for the security provided by cylinder locks. That is because they are manufactured from heavy metal and are incredibly difficult for thieves to pick. Being surface mounted, they have no edge to pry against. Our team knows all about cylinder locks, including the fact that they are in demand for securing homes, office spaces, retail stores, and manufacturing and commercial buildings. Another significant security need that they are perfect to fulfill is the need for variable access for different personnel with the same locks, but with different keys via a master key system. This capability enables the use of master keys for all-areas access, but limited access to specific personnel, repair contractors, temporary workers, etc. There are other features that make cylinder locks the best security option for most commercial real estate. Working as a team, our technicians not only install and repair profile cylinder locks, but we also repair and re-key existing locks. 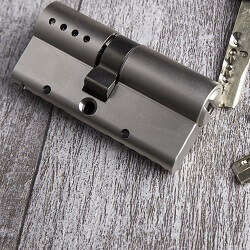 Give us a call 24/7 and we will be right over to repair or install your cylinder locks – the best type of hardware security locking available on the planet. We have reasonable pricing and our technicians are trained to be dependable, honest, and thorough. We will assess your situation and recommend only the necessary work to make your property secure again. Our decorative styles and metal finishes are designed to match whatever decor you have. There are cylinder locks in chrome, nickel, brass, and other more traditional finishes to suit you.